WGPAT was founded in 1985 by Professor Wim Hekkens, University of Leiden, The Netherlands, to coordinate research on laboratory gluten analysis in food and on clinical evaluation of coeliac patients’ sensitivity to prolamins. The group comprises physicians, chemists, nutritionists and food scientists from different countries and it has successfully cooperated with the starch-producing industry, with manufacturers of gluten-free products, with manufacturers of test systems for gluten analysis in food, with national and international coeliac societies and with official organizations such as the Codex Alimentarius Committee on Nutrition and Food for Special Dietary Uses. In 1999 the group gained non-governmental organizational status as an observer to Codex Alimentarius (Stern et al.,2001). By a dual approach, laboratory methods of gluten analysis and clinical research into gluten sensitivity have been tackled by the group. Clinical work was conducted on oats and on the safe gluten threshold in gluten-free products used for therapy of patients with coeliac disease (see Dr. Pekka Collin et al., University of Tampere, Finland; Prof. Carlo Catassi et al., University of Ancona, Italy). 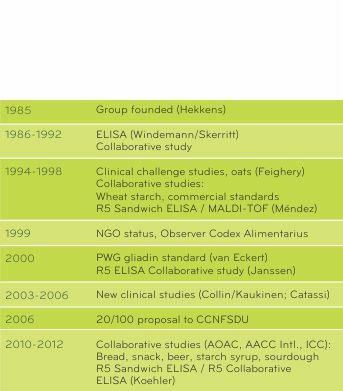 These clinical studies together with progress in analytical methodology concerning gluten analysis have led CCNFSDU in 2007 to forward to the commission the draft-revised Codex standard for foods for special dietary use for persons intolerant to gluten for final adoption, which has been accepted in 2008. Coeliac disease is the main clinical topic of WGPAT work. It is a permanent gluten-sensitive autoimmune enteropathy triggered by gluten. It has a genetic basis expressed by HLA markers (HLA DQ2, DQ8). It is a lifelong disease affecting all age groups and it shows many clinical presentations. Considering all of these (active, silent, latent forms) it has a prevalence of 1:100 to 1:200. Thus it is a relatively commonly disease. Basically it is responsive to dietary therapy, namely the gluten-free diet. Gluten-free diet is also an efficient measure to prevent macronutrient and micronutrient deficiencies as well as growth deficiency in children and also the development of refractory lesions, of additional autoimmune diseases and malignoma of the gastrointestinal tract in coeliac disease. Scientific progress has helped to improve evidence-based regulatory solutions for defining and controlling the gluten-free diet at an international level (see Wieser& Koehler, 2008; Stern, 2008). WGPAT has worked towards a gliadin reference material (see van Eckert et al., 2006) and has produced “PWG gliadin” as the basis for analytical quantification of gluten and toxicological in-vivo studies. This material is available in 100mg-batches from the WGPAT chairman and is the only well-characterised gluten reference material available. In the early years, group work was focused on new ELISA methodology in gluten analysis since traditional methods had been found not to be adequately sensitive and reliable. Further work, in particular close collaboration with Professor Enrique Méndez, University of Madrid, led to improved ELISA methods with sandwich and competitive assay systems based on the monoclonal R5 antibody directed towards the gluten peptide QQPFP in gliadins, hordeins and secalins. Immunochemical work was accompanied by mass spectrometry, HPLC, SDS-PAGE and capillary electrophoresis as supplementary methods (see Garcia et al., 2005; Méndez et al., 2005; Valdés et al., 2003). In 2006 the R5 ELISA method was endorsed as a type 1 method by the Codex Committee of Methods on Analysis and Sampling (CCMAS). Further analytical work includes novel immunochemical methods that have evolved over the years and new techniques for gluten determination such as mass spectrometry, which remain to be validated for their performance. WGPAT has an active role in coordinating and contributing to collaborative studies on gluten analysis (see table) and will continue with these efforts in the future. Here, the aim is to assist in providing approved standard methods with different organizations (e.g. AOAC, AACC International, ICC). Even after much scientific progress has been made in analytical and clinical terms, still open questions remain such as long-term challenge studies, special evaluation of highly sensitive patients, consideration of gluten consumption data in different countries of the world, inclusion of glutenin as a potentially toxic substance in coeliac disease, and the inclusion of a numerical safety factor in food regulations. Alternative forms of therapy and prevention of coeliac disease appear at the horizon today. Recently, the group has decided to open also for food technologists with the aim of assisting in the production of gluten-free food with improved quality.Thus, much work remains to be done. WGPAT offers its active help to advance science and practice as well as evidence-based food regulations in the dietary therapy of coeliac disease.